Mull Eagle Watch Well look at you! 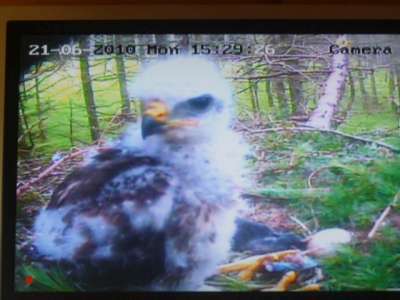 Sorry couldnt come up with a song title about how much our buzzard chick has grown. Our buzzard was 4 weeks old yesterday and just look at the size of it! Mum has been brilliant bringing in voles, frogs, slow worms and even moles. The rate of growth is phenominal. Each day there are huge differences. The feathers are really coming through now and our chick (still has no name!) is grabbing food and feeding itself. Probably another couple of weeks before fledging but it has been a real honour to have a window on the world of our buzzard family. The female did virtually all the incubating and we wondered how much work the male would do once the chick had hatched, but he has surpassed himself - bringing in lots of food and even with some to spare on the nest in case the weather is bad or they have trouble finding anything. On Friday we had the first glimpse of our merganser chicks - they made a quick dash across the loch from one side to the other - this morning they mad a dash to the small island in front of the hide and then disappeared in the long grass. The sand martins have suddenly increased in numbers - several families have fledged and now spend time flying across the loch looking for small insects and then line up on the fence near the lochside. Our powerful camera is able to get a real close up view of these lovely little birds. Our female Great Spotted Woodpecker continues to visit the peanut feeder to the delight of our visitors - hopefully we will get a chance to see a youngster join her too. We were delighted to get a real close up view of our red throated divers - a truly stunning diver - still waiting to see if they produce any chicks. Our orchids are coming through now and there are butterflies everywhere. Skye and Frisa I hear you shout - Oh yes - of course - well they have been on great form recently - very much back together - spending time in the larches and near the loch side. Frisa is going through a moult at present so not looking her best but still a beauty to behold! And finally, I am sure many of you are aware of the news from Loch of the Lowes - Lady, one of the oldest breeding ospreys was not expected to survive the weekend. However, as I am typing this blog, I have the webcam on and she is feeding her two chicks. What an incredible legacy she will leave behind her - 46 chicks successfully fledged - what a great contribution to the osprey population. I hope she manages to survive long enough for the chicks to fledge successfully - there are a lot of eyes on her just now! Good Luck Lady. Thanks Debby and that buzzard chick is just so cute. Pleased to read about Skye and Frisa putting on their best shows for you. Fingers so crossed for next year although that seems a long way off right now. Birdsaregreat that song does cover all events as you rightly say. There is a song which covers all the recent events from Mull, Loch Garten and Loch of the Lowes, whether they be happy or sad, including all the interest shown from all over the globe, Louis Armstrong's "What a wonderful world". Glad thigs are good on Mull and I expect you are all enjoying the hot (not me) summer weather. I have been glued to the Loch Lowes site and today Tuesday she is flying a little, preening, feeding herself and the chicks what a journey she has been on. Like you I hope she makes it until August to see her beloved chicks leave for Africa. I thought we had had enough sadness and emotional times with poor Frisa and Skye this spring and here I was again along with hundeds of others in different countries crying again and hoping things would work out. As Richard at Loch Garten says "an emotional rollercoaster each year". Thank you Debby. He is gorgeous! Who needs television when you can have our wildlife on webcams. Marge has had me sitting at my laptop as much as I could over the weekend. Hopefully, she has now turned the corner. Off on holiday now on Thursday to Scotland for 3 weeks and will be able to call in to Loch Garten. Sadly, I won't be on Mull this year but up to Orkney instead. Thanks for the blog debby, love the photo what a sweet little chap or chapess it is. I'd call him Buzzy! What a day it has been today with the goings on at LOTL. Our wildlife is more dramatic and exciting then any soap opera! Fingers crossed for The Lady of the Loch.